Many recitations of the first chapter in the Quran, known as Al-Fatihah, have been posted on Youtube. One, which caught my interest, broadcasts the sweet voice of Sheikh Fahd Al Kanderi. At the same time, striking images are displayed in the background, and English translations are super-imposed on the images, interpreting the Arabic. 7. 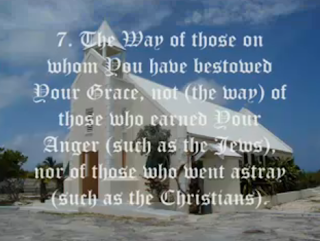 The Way of those on whom You have bestowed Your Grace [the image of a mosque], not (the way) of those who earned Your anger (such as the Jews) [the image of a synagogue], nor of those who went astray (such as the Christians) [the image of a church]. Amid the viewers' comments are repeated expressions of delight about the beautiful recitation. One comments "THE BEST FATIHA EVER IN﻿ THE WORLD...". However alongside these praises another contributor asks a simple but profound question "Why is God's wrath upon the Jews? ... Is this also﻿ taught in Islam?" “The best-known chapter of the Quran is al-Fatihah ‘The Opening’. This sura is recited as part of all the mandatory daily prayers – the salat –and repeated within each prayer. A faithful Muslim who said all their prayers would recite this sura at least seventeen times a day, and over five thousand times a year. the Master of the Day of Doom. Thee only we serve; to Thee alone we pray for succor. nor of those who are astray. This is a prayer asking Allah’s help to lead the believer along the ‘straight path’. As such it is true to the heart of Islam’s message of guidance. But who are those who are said to have earned Allah’s wrath, or gone astray from the straight path? Who are these people who deserve to be stigmatized in every Muslim’s prayers, each day, hundreds of thousands of times in many Muslims’ lifetimes? These two paths are the paths of the Christians and Jews, a fact that the believer should beware of so that he avoids them. … the Jews abandoned practicing the religion, while the Christians lost the true knowledge. 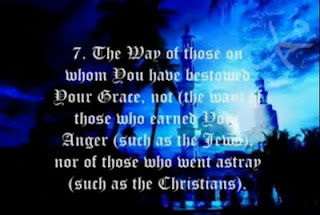 This is why ‘anger’ descended upon the Jews, while being described as ‘led astray’ is more appropriate of the Christians. … We should also mention that both the Christians and the Jews have earned the anger and are led astray, but the anger is one of the attributes more particular of the Jews. Allah said about the Jews, ‘Those (Jews) who incurred the curse of Allah and His wrath’ (Sura 5:60). The attribute that the Christians deserve most is that of being led astray, just as Allah said about them, ‘Who went astray before and who misled many, and strayed (themselves) from the right path’ (Sura 5:77). To be genuine and effective, reconciliation between Muslims and those they refer to as 'People of the Book' (Jews and Christians), requires that Al-Fatihah and its meaning be discussed openly. That devout Muslims are daily declaring before Allah that Christians have gone astray and Jews are objects of divine wrath, must be considered a matter of central importance for interfaith relations. 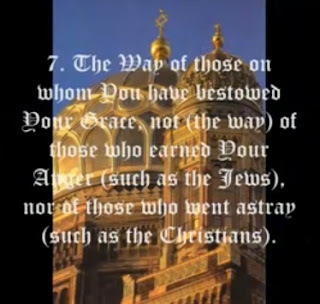 This is all the more so because the interpretation of verse 7 which relates it to Christians and Jews is soundly based upon the words of Muhammad himself. As Al-Fatihah is the daily worship of Muslims, and represents the very essence of Islam itself, the meaning of these words cannot be ignored or glossed over. It is as if the castigation of Jews and Christians is so routine in the course of prayer that average Muslims would not even believe there is anything improper about this. Which explains their ability to declare Islam is a religion of tolerance and peace, while simultaneously admitting, in a brainwashed way, that they despise Jews and Christians. "Show us the straight path, The path of those whom Thou hast favoured; Not the (path) of those who earn Thine anger nor of those who go astray." When interpreting ancient texts, it is important to consider the context. Tanstaafl has given a general contex of the Qur'an where invective against Jews and Christians is not wanting. Nevertheless, it is the historical context that should especially be taken into account when interpreting the 7th verse of Al-Fatihah. Most authorities agree that Al-Fatihah is one of the earliest suras of the Qur'an. As such, it dates from the beginning of Muhammad's prophesying when he was still living and preaching in Mecca before his move to Medina. At that early time, he still hoped that the Jews would accept his message, since they came from a religious tradition that included the ministry of prophets. Also, his relationship with Christians was still quite good and only changed drastically when he and his military forces came into conflict with the Byzantines toward the end of 630 A.D. So accusations against Jews and Christians at the time Al-Fatihah was given do not fit the historical context and are out of place within the general policies Muhammad was at that time pursuing. Consequently, the Noble Koran a translation by Muhammad Taqi-ud-Din Al-Hilali and Muhammad Muhsin Khan commits an anachronism when it, in parentheses, identifies those who incur God's wrath and those who have gone astray as the Jews and the Christians. This is not to deny that other parts of the Qur'an express such sentiments as Tanstaafl has pointed out. But the 7th verse of Al-Fatihah is not an invective against Jews and Christians. The most logical interpretation is that those referred to as incurring God's wrath and those who have gone astray are, rather, the merchant class and the idolators of Mecca who resisted Muhammad's message and against whom Muhammad was directing his preaching at that time. David - thanks for your very interesting post. In effect, you are pointing out an inconsistency between the assumed context of revelation of Sura 1 and the 'official' interpretation given to it by Muhammad itself when he clearly stated that it refers to Jews and Christians. Therefore you are not being fair when you say of Al-Hilali and Khan that they 'commit an anachronism' without acknowledging that they are adhering to the interpretation given my Muhammad himself. They are not trying to provide a text-critical interpretation of the Qur'an, but are explaining what an Islamic interpretation would need to be. An infidel scholar might discount Muhammad's interpretation, and say 'that's not what it means' but a Muslim scholar cannot place his interpretive judgement and techniques above the views of the prophet of God. In a sense the logical conclusion of your point is that Muhammad himself 'committed an anachronism', but all this does is beside the point from the point of view of piety. If being a prophet of God means anything, it means having a license to interpret the Quran, and to discern meanings intended by Allah which were not and could not have been apparent at the time the words were first uttered. Muhammad's interpretation - albeit later - must surely trump other considerations for the believer. Of course, if we are not inquiring into an authoritative religious interpretation of this text needs to be, but what the text meant at the time it was first 'sent down', your argument is a convincing one. However I was more concerned in my post with what it means in Islam and to Muslims, rather than with revisionist interpretations which dispense with the authority of Muhammad's own explanation of the text. From what I read on your web site about your background I suppose that you are fairly completely familiar with Muslim literature and the sayings of Muhammad. You may be aware of some portion where Muhammad specifically revises the statements of Al-Fatihah, but I am not aware of any. I do not question that the attitude Muhammad showed toward Christians became hostile after his military confrontations with the Byzantines; his later prophecies reflect that change of attitude. Considering Muhammad's later prophecies and his apologetic of abrogation which I assume rules in Islamic thought, it is not surprising that Muslims may identify those upon whom is [God's] wrath and those who have gone astray as Jews and Christians. Still, I am a human being who understands how other human beings react to stimuli within their historical context, and I assume others share this same understanding. From this standpoint isn't it obvious that at a time when Muhammad's relations with Christians were amicable and while he was still hoping to woo the Jews to his prophetic vision he would not have been emitting prophecies that rejected them in absolute terms. Notwithstanding Islam's present hostile attitude toward Jews and Christians based on the idea of abrogation and Muhammad's later prophecies, Al-Fatihah does not contain an anti-Jewish and anti-Christian polemic. When one considers that Muhammad Taqi-ud-Din Al-Hilali and Muhammad Muhsin Khan have placed "such as the Jews" and "such as the Christians" in parentheses (http://www.dar-us-salam.com/TheNobleQuran), it is obvious that they recognize that these statements do not appear in the Arabic text. Since these polemical references to the Jews and to the Christians are not part of the Arabic text and since they do not proceed from, or fit into, the historical context of Surat Al-Fatihah, should they ever have been made part of the English rendition at all? Let us grant that they were included to express what some subsequent parts of the Qur'an say and to agree with the contemporary overall attitude of Islamic theology and rhetoric towards Jews and Christians. But even recognizing this, wouldn't it have been better --and a more honest treatment of the text of this sura-- to have relegated such observations to commentary. I recognize that the purpose of your post is to clarify what Muslims believe and to illustrate how they understand the part of the Qur'an under discussion. But I find troubling interpretations that go out of their way to inflame the attitudes of Muslims toward people of the Book. Such attitudes are bound to encourage persecution and maltreatment against him who the Muslims recognize as the Messiah and against his people. Not that this is unexpected since Jesus told us that the time is coming when whoever kills us will think he offers service to God. But it is surprising that such attitudes should be cultivated in those who claim submission to the God of Abraham. Allah left Muhammad early when he proposed jihad by killings and taking slaves. Fateha was his prayer, not Allah's words, so that Allah came back to Him. He left this prayer or doa to his followers. All prophets and their scriptures failed. That is the way to be, Allah's way. Do not create god out of human. Do not idolized prophet like the moslems. Christians and Moslems both shirked, the greatest of Allah wrath and unforgiven sin, and Jews were so prejudicial that they killed prophets. Allah only wants to be thanked, praised (not prayed to) and human only do goodness. As a revert from Christianity but I don't judge because only Allah, the Exalted, knows what is in every person's heart and we as Muslims are peaceful religion, but to comment on your statement. Do not Christians teach all people including Jews will not go to Heaven if they do not believe that Jesus is our Savior, that he is the Son of God and that he died for our sins? This is what I was taught as a Catholic Christian for 43 years before I found Islam and studied the Qur'an and Hadiths and continue daily in study. Fact is Islam teaches we do not judge if individuals will go to Hell or Heaven for only Allah knows this and is judge, so we can't say because a person is a Jew they will go to hell, or a Christian as individuals but what they teach is not right and as a whole this upsets the Almighty because they do not accept the truth that was revealed to them and those who do know the truth, the scholarly leaders in Judaism and Christianity who spend their entire lives in study, know the truth and teach wrong to the people who follow them. And for your knowledge, the Qur'an also warns Muslims of punishment if they do not follow the right path in Islam. Fact is I became a Muslim because I recogized as a follower of Jesus that Muslims are more Christian then Christians are except we follow the right way through the teachings of Muhammad peace be upon him and the Qur'an that is the true word of God without change. 3 And why beholdest thou the mote that is in thy brother's eye, but considerest not the beam that is in thine own eye?" Dear Amanda, thank you for your feedback. I have a few questions to ask you. First, I agree that Islam teaches that one cannot know who will go to hell or to heaven. Even Muhammad is told in the Koran to say that he does not know what will happen to him: 'Say, "I am not an innovation among the Messengers, and I know not what shall be done with me or with you. I only follow what is revealed to me; I am only a clear warner." (Sura 46:8-9.) Does it not trouble you that Muhammad did not know whether he was going to heaven or to hell? The Koran also says that shirk is the one sin which Allah will not forgive, and it also says that to believe that Jesus is the Son of God is shirk. So I think it is clear from this that the Koran is saying that Christians will not be forgiven. If you have a different understanding of this - that shirk can be forgiven, or that belief in the Son of God is not shirk - I would be most interested to know. Also, there were two comments in your post which intrigued me. Why do you say that Jewish and Christian scholars know the truth and deliberately teach lies? Have you met many scholars like that? That is very concerning to hear. It is not my experience. Also you say I 'pretend' to know the Koran. This means you say I am a liar, 'pretending' knowledge I do now have.. How do you know my heart? Aren't you judging me - someone who you do not know - when you say such things? Did you find something untrue in what I said about the Koran? I do understand that I do not have perfect knowledge of the Koran. The question is: was anything I was saying factually inaccurate? No answer from Lady Fatima?